Morning came very quickly for some of us as we adjust to eastern time and the need to wake up early instead of sleeping in late. Everyone did awake, however, and prepared for the day before heading to the flag raising and breakfast. It was quite cool last night and it was a great temperature (low 60s) for a morning hike to the parade grounds. The Scouts and leaders slept well and nobody has asked to go home as of yet. For breakfast, we enjoyed french toast and sausage. Right after this, it was off to merit badge classes! The first-year Scouts all headed down to the waterfront to enjoy an early dip in the lake as they worked on Swimming Merit Badge. Other scouts headed in all different directions to attend classes on a variety of areas such as Rifle Shooting, Personal Fitness, Emergency Preparedness, and Movie Making. The weather was nice and spirits were high as the routine of camp life was starting to take shape. Mountain Man instructors help Ryan, Joe, and Liam build a fire. 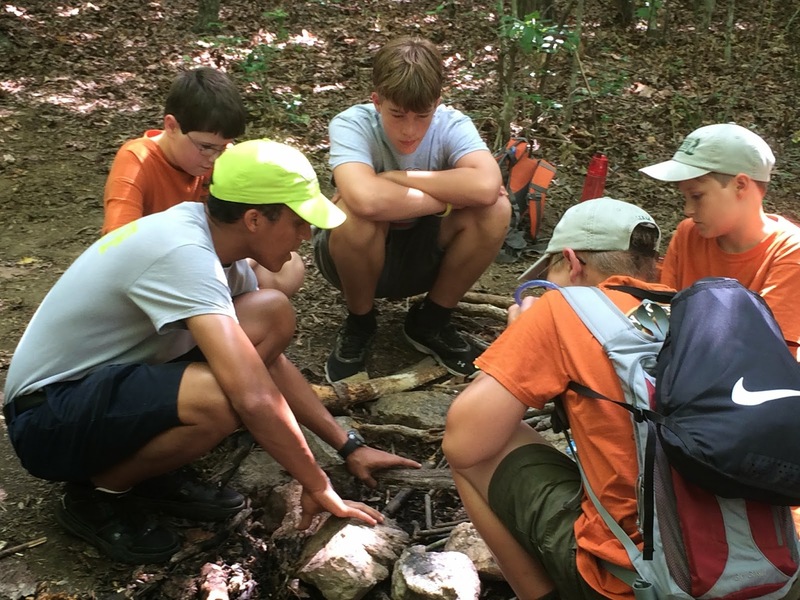 First-year Scouts attended the Mountain Man program where they will complete several requirements for Tenderfoot, Second Class, and First Class ranks. Veteran scouts continued their pursuit of some additional merit badges as well. John and Andrew participated in COPE (Challenging Outdoor Personal Experience) where you work as a team to climb, swing, rappel, etc. to solve problems. Today, the COPE program involved a good bit of team-building exercises. Most of the climbing, etc. will be done later in the week. John and Andrew come up with a teamwork game plan at COPE. During lunch, we enjoyed chicken fingers, french fries, corn, and applesauce. The leaders have noticed that there are several Scouts who claim to be picky eaters. This is changing a bit after some coercion by leadership. Scouts are learning that some food is not all that bad and that it's better than going hungry. By the end of the week, who knows what they'll eat? Everett, Jason, and Ryan at the First Aid Merit Badge class. This afternoon was filled with activity. The first-year Scouts attended a merit badge class for First Aid. They should wrap up that merit badge tomorrow. 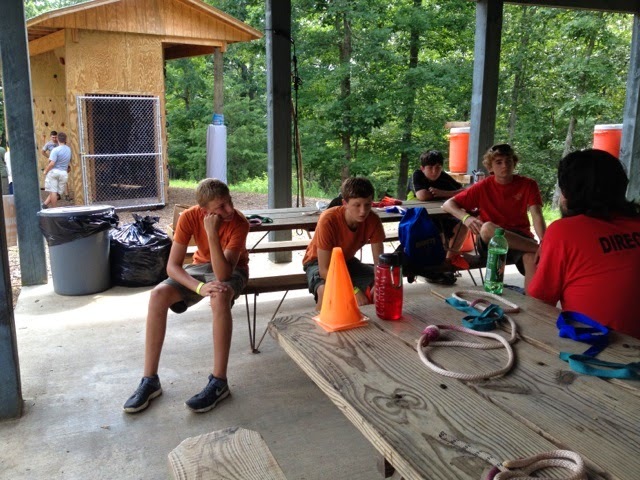 Other Scouts enjoyed a variety of merit badges and some free time. Dinner came quickly for one leader writing the blog summary for Day Two. A quick wrap-up and change into Class A was in order since the rest of the troop was sharp and on time! At dinner, Scouts were less thrilled with the menu. It was a type of pot roast that didn't look too appetizing. However, most agreed that it was very tasty once you tried it. It was accompanied by mashed potatoes, green beans, a roll, and cake. Scouts clamored to get out of there because a bunch of free time awaited them! Many went to the waterfront for some swimming. Others attended a basic CPR course for Swimming Merit Badge. All scouts returned to the campsite tired but satisfied from the productive day. Each Scout had a shower (with soap and shampoo) and went quietly to bed. 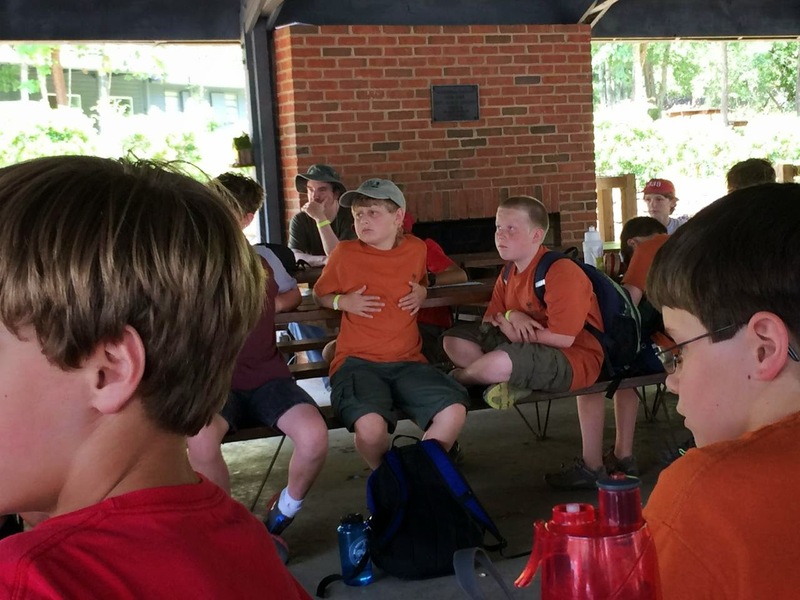 First-year Scouts are getting better at fitting into camp life. There are a few that are homesick, but nothing serious. The troop's veteran Scouts have been very helpful in showing them the ropes and taking them under their wing. It's been nice to see the troop work together. Everyone is doing well outside of a few sore legs and some minor stomachaches. Now that the leadership has got the routine down as well, there should be a blog post every night. To view more pictures from Day Two, please visit our online photo album.